If you're new to Figured, or you're just needing a refresher, this guide's for you. Looking for a check list of what to do? Check out our Financial Manager cheat sheet. On your main Figured dashboard (my.figured.com) you'll see a green button that says Create a Farm. 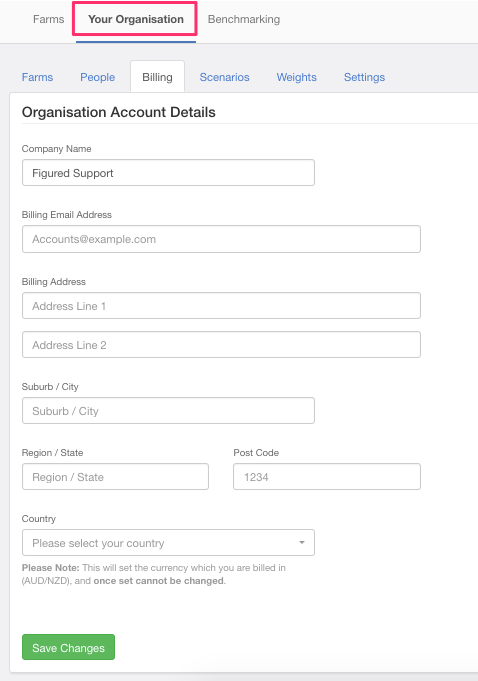 Click that and fill in any farm details you're asked for like a name, or a production type, and then connect it to your Xero account. 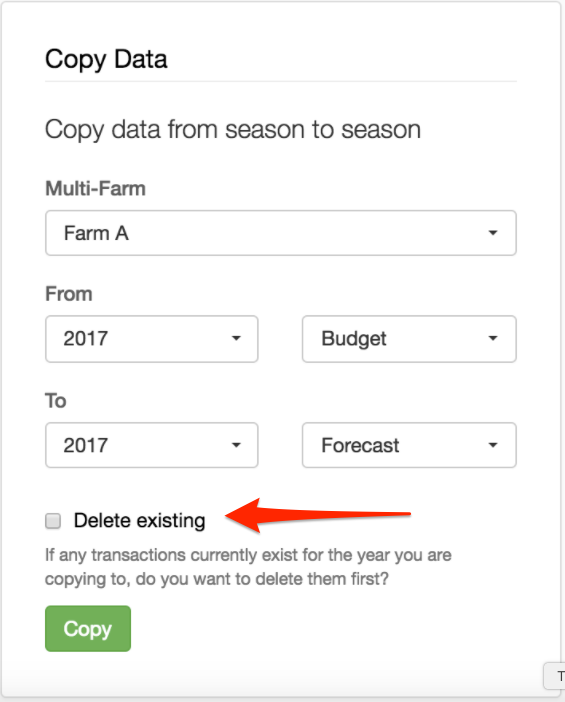 You'll need to nominate a default bank account for your farm which will make up the opening and closing bank account balances on financial reports. It's important to note that any liabilities like a Farmlands account, or a credit card, should never be set as a bank account. This will affect your bank account balance in your reports and will give an inaccurate view of your current cash position. 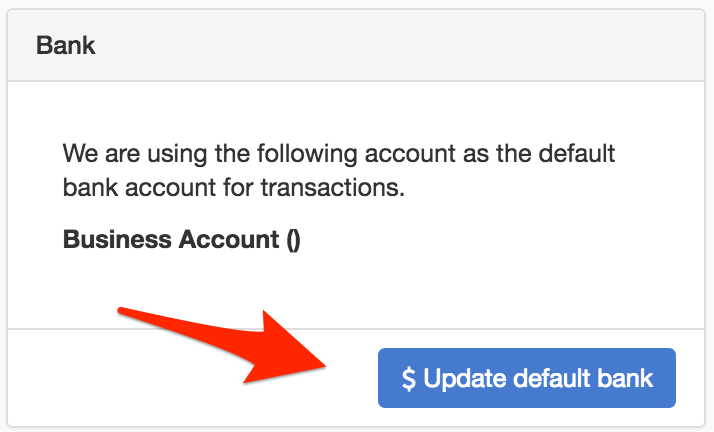 Instead you can update these liabilities to current liability from within Settings > Chart of Accounts, from there you just need to search the account name, click into it, and update the Type which is shown below. NOTE: We recommend you have these accounts set as liabilities within Xero too so that the financial reports in each app reflect one another. Pop across to your planning tab, where you'll want to do a couple of things. First up, you'll want to set your opening bank account & GST balance which will be used for your budgeting. Then you'll move across to account configuration. In here, you'll be able to categorise your accounts to a range of category options that align up with the account type (i.e. revenue accounts have a pool of revenue categories). You can also update the payment period which will be used for cash / accrual purposes in your budgeting, and you can update the preferred view of the account - summary, detailed, or hidden. This page auto saves each time you make a change. REMEMBER: It's good to set payment periods now, as creating a budget first and setting payment periods later means your existing budget won't be affected. Finally you'll head into Season Overflow which is where you will overflow any budgeted / forecasted transactions that have their cash date fall in the first month of your new financial year. This is typically only used for when your budget is established already. With all the setup of your budgeting done - you can now move onto getting it all filled out. There's two ways to enter your budget into Figured. The first way is via the planning tab directly, ensure you're viewing the Budget and then begin entering numbers in each editable cell. When you make a change to an account, Figured will highlight the row yellow for you. 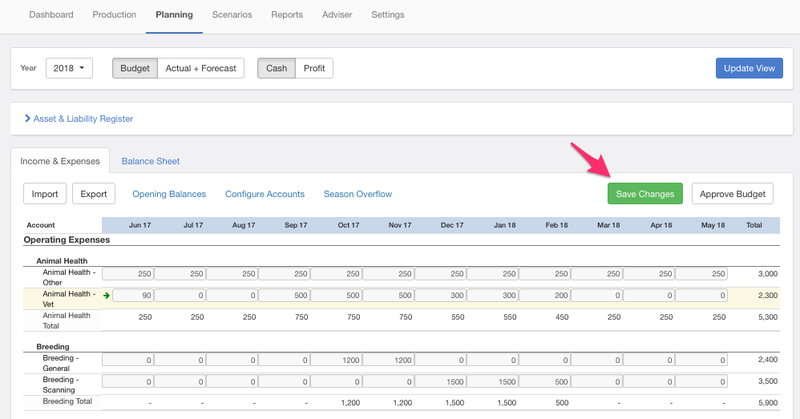 The second way to create your budget, is to use the export / import tool to export a blank template of your planning tab accounts, and then importing it back in once you've entered the budgeted numbers. If you've got actuals already sitting in your Xero account, you can export a full year of actuals for the last financial year, and then import these to be your first year budget on Figured! Once you're done there, you can hit Save Changes and then Approve Budget which will lock your budget and prevent it from being edited. You can edit your locked budget at any time by simply unlocking it - but we recommend you keep it locked and only edit your forecasts. After your budget has been locked, you can move onto creating your forecasts. 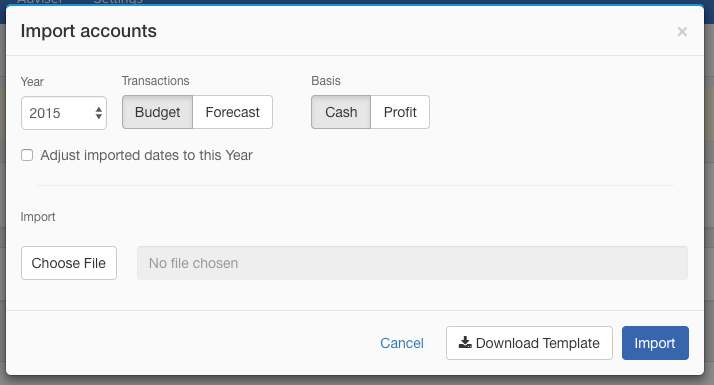 You can quickly build out your forecasts by copying your budgets to your forecasts. 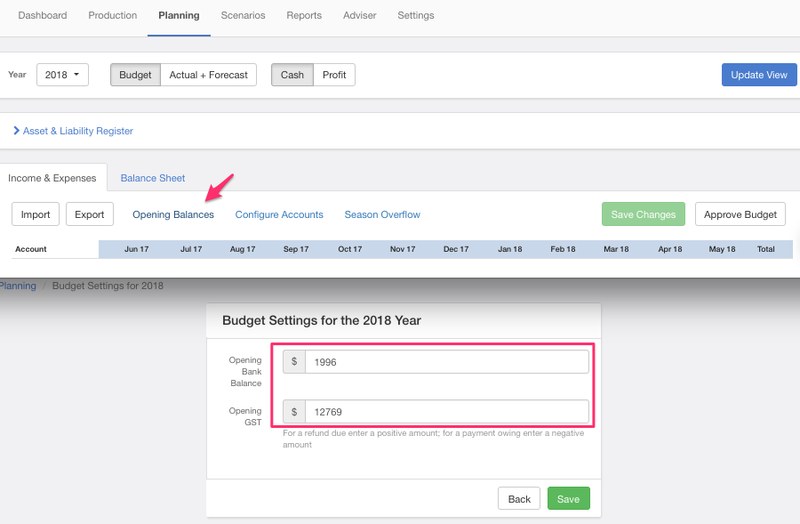 In your planning tab, click Copy budget to forecasts and follow the steps to copy this years budget to this years forecasts. Ensure to select Delete existing on the subsequent page as this will remove any existing forecasted transactions, and prevent any doubles up of data. Figured is a collaborative tool and we encourage all members of the farming team to be on board. If you wish to add a single user to the farm, you can do so under Settings > People, and from there you'll be able to enter a users email address and specify the permissions you wish them to have on the farm. The invited person will get an invitation to either login to an existing account, or register a new one and then they'll have access to the farm. 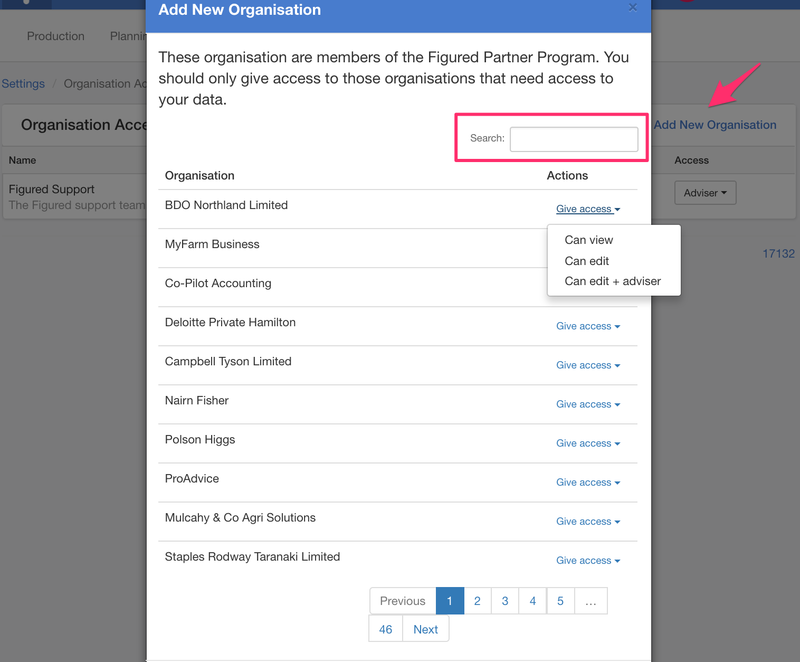 If you wish to add a firm to your farm, whether it's your accountants' firm, your bank, or you're looking to invite the rest of your advisory team, you can do so under Settings > Organisation Access. Much the same as inviting a personal user, but in this case you can invite an entire organisation to have access to your farm. All accountants & advisors as well as banks on Figured are available to add on this page. Simply search for the name of the organisation and specify the permissions you wish the organisation to have to your farm. With the farm setup and the team on board, the final step is to ensure the billing has been activated for the farm which will allow for continuous access to the farm and its data. 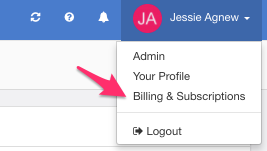 If you are a farmer, or you are personally taking on the billing, you will first need to update your personal billing details which is available under Profile (top right) > Billing & Subscriptions. Using the steps provided, you'll need to enter your billing address as well as choose whether you wish to setup payment by bank account (direct debit) or credit / debit card (direct credit). Once your payment method has been updated, head back to the farm and go into Settings > Billing and nominate yourself as the bill payer. If you're part of an accountants' firm or an advisory firm and the firm will be taking on the billing, then you'll need to setup the organisation billing first and then nominate your firm as the bill payer. 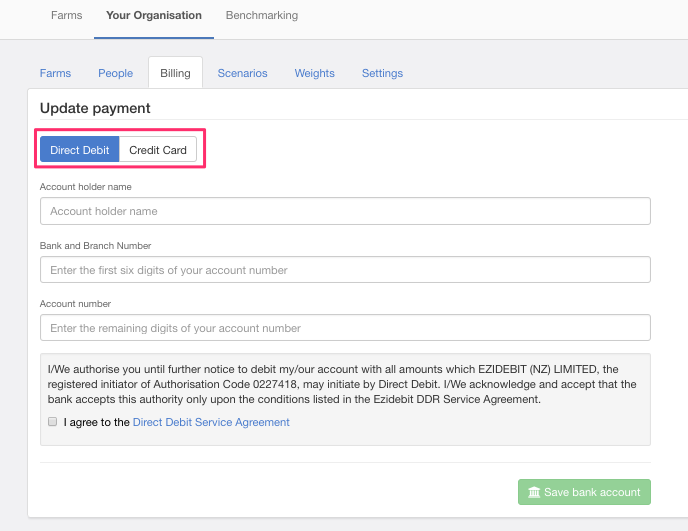 First up you'll want to setup organisation billing. You must have billing access to complete this step. 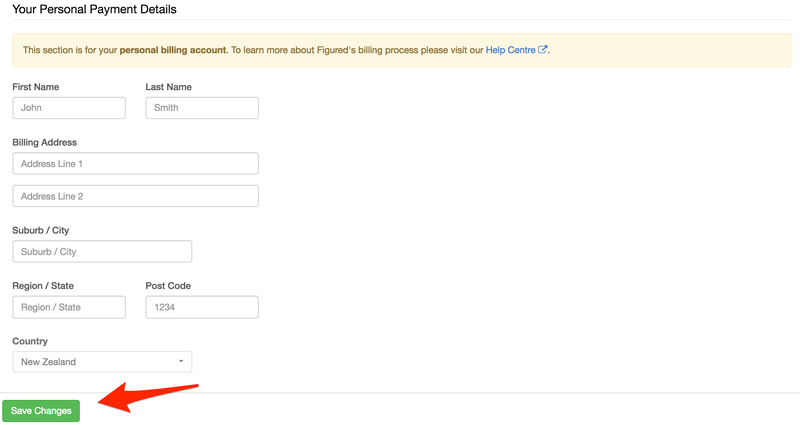 To do this, head to your Figured dashboard > Your Organisation > Billing and fill in the steps that follow. You'll need to enter your billing address as well as choose whether you wish to setup payment by bank account (direct debit) or credit / debit card (direct credit). 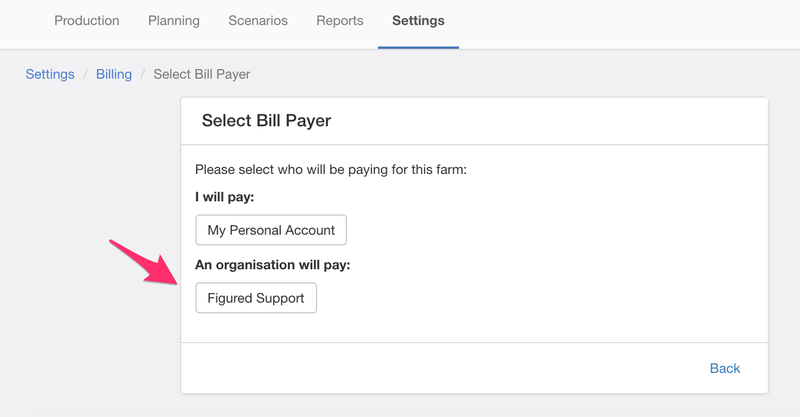 Once your payment method has been updated, head back to the farm and go into Settings > Billing and nominate your firm as the bill payer. NOTE: You must be a member of the organisation to assign the billing to it first. 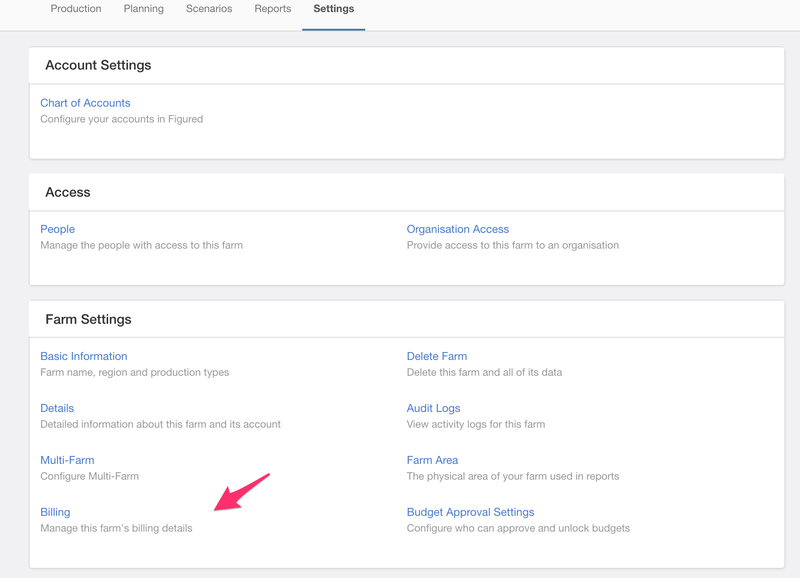 If you'd like your client to take on the billing, have them login to the farm and assign the billing to their account using the Personal billing steps outlined above. You can dive in and generate some reports, or re-forecast for the weather - if you need a hand, drop the team a message via the green bubble anytime.